EXCEPTIONAL MODERN PROPERTY. REDUCED PRICE FOR QUICK SALE. A modern villa with pool benefitting from a countryside setting, spacious accommodation and open plan style living, spacious terraces and internal courtyard. 7 minutes from Seillans, officially designated as one of the most beautiful villages in France. 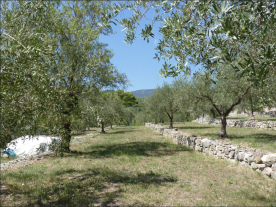 •	Set amidst 7900 sqm of mature grounds and terraces of olive trees this modern property benefits from a peaceful and calm countryside setting with beautiful views, all within access of the popular medieval village of Seillans. •	Designed and built by an architect in the 1970's the focus of the design is space and light, incorporating the extensive terraces and internal courtyard into the reception space ensuring open plan rooms and the emphasis of the spectacular views. •	Accommodation includes open plan reception rooms with wood burning stove and dining area for 10, a covered internal courtyard a master bedroom suite with terrace, bath and shower room, separate toilet, and changing room. 2 further double bedrooms and shower rooms plus office. •	The property features a double garage, wine cellar, large utility room, and further large study with roof terrace, which could be used as a further bedroom. 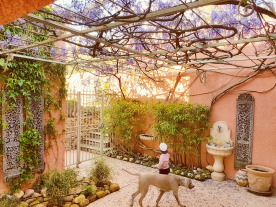 •	A fenced swimming pool set amidst charming gardens with grape vines and fruit trees, and summer kitchen completes the property. Within close proximity to equestrian facilities, vineyards, hiking trails. Approximately 14km from the famous Terre Blanche Golf Spa Resort, 25km from the stunning Lake Saint Cassien.